THE IDEA of Thermae Romae is actually insane: There are wormholes (or whatever) between modern Japan and ancient Rome. Through them people in a bath can dive from one time and place to another. When an insane idea is used skillfully and freshly, you will have a very fine manga experience. 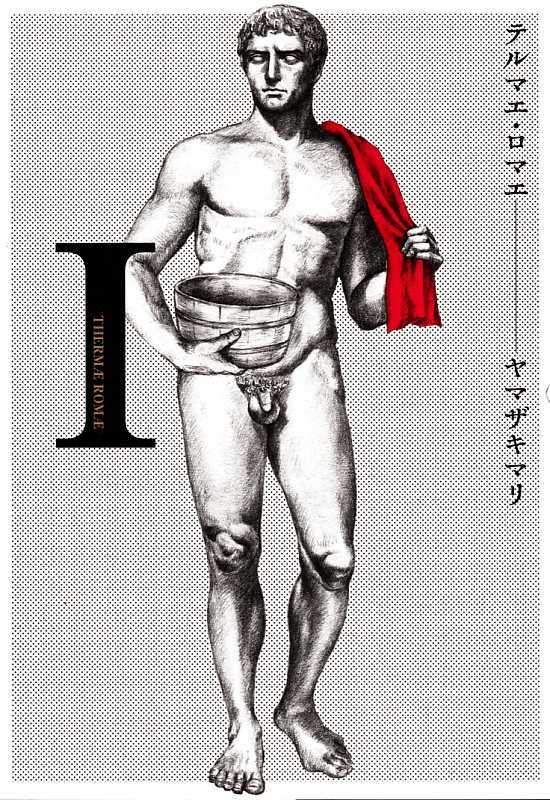 Thermae Romae is written and illustrated by Mari Yamazaki. The comedy received in Japan the Manga Taisho award in 2010. The award is given to the best relatively new manga series, as voted by workers in Japanese bookstores. In the same years, Thermae Romae also won the Osamu Tezuka culture prize for the best short manga series. Thermae Romae has been published in young men’s magazine Comic Beam since 2008. The first collected book came out in late 2009. This far four collections have been published. Already the first collection was near the top of the sales lists in Japan, which is quite uncommon for a new seinen series. A short anime series (only three episodes) of Thermae Romae was seen in Japan in early 2012. Yen Press revealed recently, that it will be publishing the manga in English. LUCIUS Modestus is an architect in Rome in the first century AD. His architectural ideas are far from popular, but like a true Roman gentleman, he likes to relax in a real Roman bathing house, a thermae. The life of Lucius is completely shaken, when he is sucked into a strange hole at the bottom a thermae pool. To his Roman friends it seems that he faints in the pool, but Lucius finds himself suddenly in a strange country. There are flat-faced people with eyes askew, and they are bathing in a house surrounded by natural stones and images of snow-topped mountains. Their bathing rites with machines for drying ones hair are strange indeed. Soon, Lucius pops up back in Rome (his friends see him reviving after fainting). In his hand he has a queer bottle of juice – as a proof that what happened to him was not just a dream. Lucius’ second trip through the wormhole is even stranger. Again he ends up in modern Japan, but this time he appears in a hot bath full of monkeys. A man speaking furiously in a funny language forces him to move from the pool for Japanese macaques to the pool for humans. Friendly bathers offer him sake and eggs that have been cooked in the hot water. When Lucius returns to Rome, he has a grinning macaque with him. The third trip takes Lucius to a modern home bathroom. The fourth time he appears in a high end shop for bathing equipment. A Roman application of a Japanese bath. THERMAE Romae is not burstingly or explodingly funny. It is very funny in a quietly human and gentle way. Mari Yamazaki illustrates well the puzzlement of Lucius Modestus, when he arrives in the middle of a completely different culture, without a single common word. Of course, the Japanese are quite as surprised when they see the handsome Roman male who speaks Latin. Soon, also some common ideas are found – even though Lucius is not quite as ashamed of being naked as the Japanese. And even though Lucius ties his yukata in the way a toga is tied. Lucius takes home modern ideas from every trip and adapts them to Roman technology. Thus he ”invents” for example a shower and a bathing hat. In Rome, the television of a luxurious Japanese bathtub is turned into an aquarium with fish at Roman bathtub. In stead of sake, Lucius starts to offer wine in a Roman thermae. These inventions soon make Lucius famous, and he becomes even the caesar Hadrianus’ favourite. The setup of the story brings quite naturally many comical situations. Yamazaki is very skillfull in bringing the comedy up in a slow and gentle way. And she does not dwell on an idea too long after it has been brought up – which is a quite common sin in manga. The simple basic story is given new variations all the time. Thermae Romae is not visually sparkling, either. Yamazaki’s style is actually quite ”Roman”. Many illustrations make me think of Jacques Martini’s Alix graphic novels. Yamazaki is also very good with drawing sceneries and buildings. As a bonus, the manga has lots of information on the history of bathing, both from Rome and from Japan.